Commandaria is an amber-coloured dessert wine produced in the island of Cyprus since 4000 years ago. It is produced by local Cyprus grapes mavro (black) and xinisteri (a fruity white grape). The initial references about Commandaria are going back to ancient Greek poet Homer who mentions a sweet wine produced in Cyprus. Commandaria gets its name from the Gran Commanderie, an area surrounding the well preserved Kolossi Castle which is located west of Limassol. The Castle was the Commanderia (Headquarters) of the Knights Templars in the 12th Century. The wine became very famous among the Knights. It was consumed locally but also was exported to many European Royal Courts. Soon the wine became synonymous with Gran Commanderie and afterwards this name was extended also to the area where the wine was produced. During his Marriage with Berengaria, In the 12th century Richard the Lionheart pronounced Commandaria as the "wine of the kings and the king of the wines". The geographical indication refers to an area of 14 villages located in the southwest part of the island of Cyprus on the south facing slopes of the Troodos mountains at an altitude of 500-900m that have been known as "Commandaria". 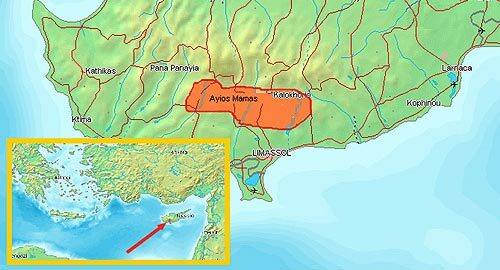 The 14 villages that compose the Commandaria wine-producing area include Ayios Yeorgios, Ayios Constantinos, Ayios Mamas, Ayios Pavlos, Apsiou, Yerasa, Doros, Zoopiyi, Kalo Chorio, Kapilio, Lania, Louvaras, Monagri and Sylikou. The wine has a rich history, said to date back to the time of the ancient Greeks, where it was a popular drink at festivals celebrating the goddess Aphrodite. A dried grape wine from Cyprus was first known to be described in 800 BC by the Greek poet Hesiod and was known as the Cypriot Manna. Legend has it that in the 13th century Philip Augustus of France held the first ever wine tasting competition. The event, branded The Battle of the Wines (fr. La Bataille des Vins), was recorded in a notable French poem written by Henry d'Andeli in 1224. The competition which included wines from all over Europe and France, was won by a wine from Cyprus widely believed to be Commandaria. Another legend has it that an Ottoman sultan invaded the island just to acquire Commandaria. Commandaria is made exclusively from two types of indigenous Cyprus grapes: Xynisteri and Mavro. Only grapes from vineyards that have been planted for at least 4 years are allowed while watering is prohibited. The grapes are left to overripe on the vine and when sugar content reaches acceptable levels (high degree baume) they are harvested. More specifically, Xynisteri is picked when at around 12 baume and Mavro at 15-16 baume. 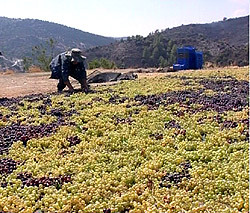 The grapes are then laid out in the sun to further increase the sugar density through evaporation. When the baume reaches 22 the juice is extracted thorough crushing and pressing. Fermentation has to take place within the confines of the 14 designated villages that lie in the Commandaria Region and the levels of alcohol achieved is up to 15%. Commandaria, by law is aged for at least two years in Oak Barrels but this can take place outside the above designated area within Cyprus under strict control and under the conditions laid down in Cypriot legislation. Currently Commandaria holds a protected designation of origin (PDO) within the European Union, the United States and Canada. © 2019 Revecca Winery. All rights reserved.